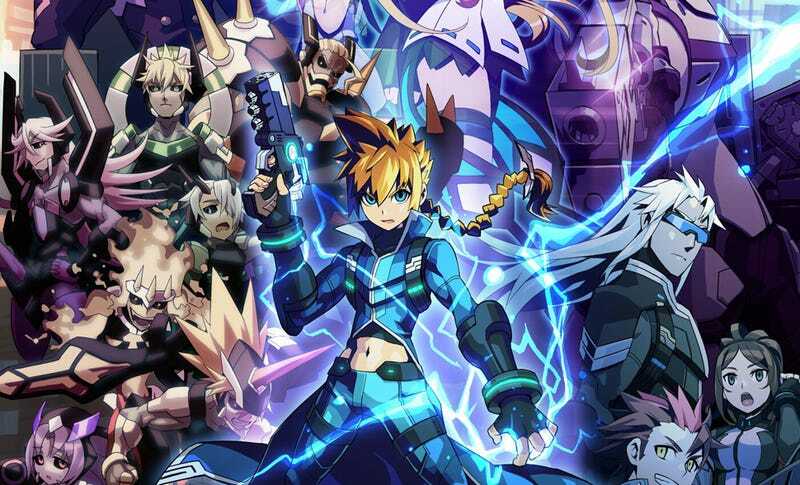 In Azure Striker Gunvolt, you play the role of the electricity manipulating Gunvolt. If you thought that with Keiji Inafune as producer, Gunvolt would be just another enemy power-stealing Mega Man clone, worry not – That's your rival character. Produced by Keiji Inafune and developed by Inti Creates, Azure Striker Gunvolt is an upcoming 2D action game for the 3DS where players take on the role of the psychic, Gunvolt, in his battle against the Sumeragi Group. Announced in this week's Weekly Famitsu, Gunvolt's rival will be the avenging character, Acura (アキュラ)... Or maybe it's "Acula"... It's so hard to tell with Japanese sometimes. According to his character bio, the character is "a psychic hunter who does not belong to any faction, but harbors a strong hatred towards the Sumeragi Group psychics. While he does not possess any psychic powers of his own, he is able to steal and analyze the psychic power factors of other psychics. He wields a weapon that mimics such powers and stands in Gunvolt's way." Additional screenshots show Acura using enemy attacks against Gunvolt. He's described as Gunvolt's "rival" which means we can probably expect some sort of understanding/friendship/bromance to develop between the two during the game. Azure Striker Gunvolt is scheduled for release on the Nintendo eshop in Japan on August 20th and internationally this summer.